That is Sintavia's guiding principle, as the Florida-based metal-AM company also performs all related processes. This advanced turbo prop is a result of disruptive engineering, with nature providing key sources of design-engineering inspiration. 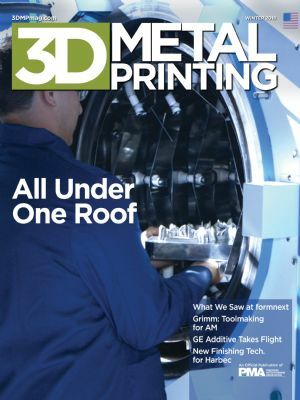 The outcome includes 35-percent additive content, a noteworthy parts-count reduction--from 855 to just 12--and lessons that will help advance additive manufacturing. Through its owner's vision, this New York manufacturer has embraced sustainability and a unique blend of processes. Itï¿½ï¿½ï¿½s also adopted new tumble-finishing technology for post-processing 3D-printed parts. The formnext exhibition and conference, held last November in Frankfurt, Germany, attracted more than 21,000 attendees who were treated to displays from some 470 exhibitors. Those exhibits included plenty of new machines, materials and software for 3D metal printing; here we offer some highlights.